It’s that time of the year again! Tonight, people all around the world are being encouraged to dim their lights between 8:30 and 9 p.m. in recognition of Earth Hour. The international event is meant to raise awareness of environmental issues and climate change. WWF said the number of countries and territories participating has grown from 135 last year to 147 this year. Libya, Algeria, Bhutan and French Guinea are among those participating for the 1st time. Sydney’s iconic Harbour Bridge and Opera House went dark as Australians switched off lights & hundreds of landmarks around the world including Washington’s National Cathedral, London’s Clock Tower, the Great Wall of China and Tokyo Tower will be dimmed at 8:30 p.m. local time. The great thing about it is that many businesses are throwing their support behind the movement and, as you watch your hockey game tonight in the dark, you can feel good knowing that the NHL has joined them. The league has announced an Earth Hour campaign of their own, with all teams hosting games tonight being asked to scale back energy usage in their arena. I like it! Ontario electricity provider Hydro One said it would mark Earth Hour by turning off non-essential electrical equipment at its office facilities across the province. Hydro Ottawa is even inviting you to a free star party at the Canadian Museum of Science & technology (7:30pm). Even the Ottawa Police are joining in the world’s largest public action for the environment. Between 8:30 and 9:30 p.m., police headquarters at 474 Elgin Street will turn off the large illuminated “ottawapolice.ca” sign on the south side of the building facing the Queensway. Do your best! 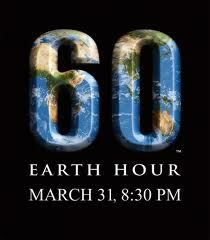 Unplug electronics or smaller appliances, turn off or dim your lights and enjoy an hour that truly makes a difference!